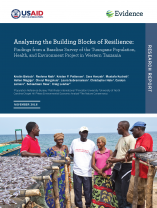 A new paper from the Evidence Project/PRB, based on a collaboration with Tuungane, a Population, Health, and Environment (PHE) project jointly implemented by The Nature Conservancy and Pathfinder International, expands the evidence base for the impact of integrated PHE programming on resilience, improving livelihoods, and adapting to climate change. In recent years, the concept of resilience has gained increasing attention as a crucial component in efforts to promote economic growth and development. Meeting demand for voluntary family planning (FP) and helping people adapt to climate change should be central to resilience programs, but are often omitted. PHE is a promising, integrated development approach for building resilience. PHE programs combine conservation and natural resource management efforts with the development of more diverse livelihood opportunities as well as the provision of FP resources and education, alongside other health interventions like antenatal care, child immunizations, and HIV/AIDS awareness and prevention. This paper analyzes existing data from the Tuungane Project baseline survey to show the pre-project level of knowledge among village residents regarding their understanding and use of FP, understanding and attitudes toward conservation, and whether or not there are linkages among those issues. The results from this analysis will help build the evidence base on the impacts of PHE programs, particularly the role that the FP component of these programs plays in building resilience, improving livelihoods, and helping people adapt to climate change.